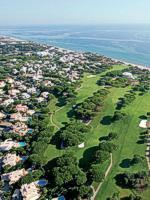 At Vale do Lobo, Europe's finest golf and beach resort, a world of leisure and luxury awaits. Situated just 20 minutes from Faro International Airport, with direct flights from most major European cities in under 3 hours, Vale do Lobo offers a completely holistic experience unlike any other. With the versatility to cater for sports enthusiasts, spa lovers, gourmands and sun worshippers, and with a selection of accommodation to suit all requirements - from simple apartments to luxury villas with pool and garden, all fully equipped and serviced daily by a personal maid – Vale do Lobo is many holiday destinations in one and a perfect place for families, with something to keep everyone smiling. Its almost year-round sun and proximity to Faro airport make it eternally attractive and easy to get to. The 1 and 2 bedroom apartments are located in a secluded area near the Tennis Academy. The apartments include 1, 2 or 3 bedrooms, 1 or 2 bathrooms, a fully equipped kitchen and a spacious living room with cable TV and direct dial telephone. All main areas have air conditioning. The private balcony overlooks a small quiet garden which enjoys lovely sunsets. 3 categories are available: Standard, Superior and Deluxe. These cosy modern linked villas have 1 to 4 bedrooms 1 to 3 bathrooms. The kitchen is fully equipped and the living room comfortably appointed with direct dial phone and cable TV, with direct access to a private patio with plunge pool or private swimming pool in a small garden. The villas are located by the tennis academy or the golf course, with views over the sea, or 500m from the beach. These large detached villas have 3 to 4 bedrooms. A fully equipped kitchen and a comfortable living room with direct dial phone and cable TV provide a relaxing environment. All main areas are equipped with air conditioning. The private gardens contain swimming pools. The Vilas either overlook the Royal Golf Course or have views over the beaches and golf course some and are right next to the Tennis Academy in the middle of the Resort.